The Disaster Assistance Response Team (DART) was created by the Canadian government in 1996 in the aftermath of a perceived inadequate response to the 1994 Rwandan genocide, when Canada's aid arrived after the peak of a cholera epidemic. The government of the day determined that it would be important in many disasters if it was able to rapidly deploy a group of people until long-term aid arrived. DART is seen by some as an example of “soft power”, they are mistaken. Wars are simply disasters writ large. Most of any military effort to impose ones will, by force, on others consists largely of managing the ensuing disaster. Any added ability to manage disaster zones adds to our ability to wage war. Just as important, an increased ability to respond to national emergencies meets the departments mandate to provide security for Canadians. Canada’s Dart is currently deployed in the Philippines to help that country deal with the effects of Typhoon Haiyan. With gusts reaching 235 miles per hour, Typhoon Haiyan was one of the strongest typhoons ever recorded. In the Philippines it set off landslides, knocked out power in several provinces and cut communications in the country’s central region of island provinces. It caused significant loss of life, a large number of injuries and damage to many homes and infrastructure. Over 670,000 people are known to have been displaced and Filipinos are currently in great need of shelter, food and water. The tropical superstorm affected an estimated 11.3 million people in nine different regions across the country. After being forward deployed to Hawaii, 43 members of DART’s Advance Party arrived in Iloilo, a province in the Philippines, on 13 November. They were quickly followed by additional CAF personnel. 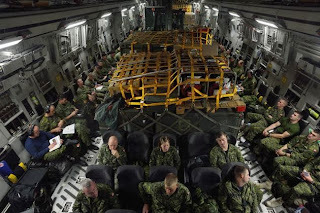 The main body of the DART, which includes a team of 50 engineers from 4 Engineer Support Regiment of the 5th Canadian Division Support Base Gagetown, began to deploy from Trenton on board a CC-177 Globemaster and arrived in Iloilo on 15 November. They brought along equipment and pallets of kit. Another 70 personnel including medical and support teams left Trenton on 14 November. At this time the Canadian Armed Forces task force includes more than 300 Canadian Armed Forces members with a broad range of specialties. There have also been air assets deployed in support of Operation Renaissance 13-1. They include a CC-144 Challenger used initially to transport the Interdepartmental Strategic Support Team to the Philippines and still in the Philippines assisting in coordination and reconnaissance in support of the Department of Foreign Affairs, Trade and Development Canada, a CC-150 Polaris transporting members of the Disaster Assistance Response Team (DART) and equipment to the Philippines, 3 CC-177 Globemaster IIIs to transport personnel and equipment to the Philippines and 3 CH-146 Griffon helicopters to provide mobility and coordination and medical evacuation. Deployed ground vehicles include a light support service vehicle wheeled command post to provide command and control capability, a light support service vehicle wheeled ambulance to provide mobility to the medical staff and provide basic level of medical support to the people of the Philippines. Engineering support includes one multi-purpose engineering vehicle to provide loading and digging capability, a rough terrain fork lift to lift heavy loads in austere and rugged environments, a heavy engineering support vehicle with palletized load system used to transport heavy loads including the Reverse Osmosis Water Purification Unit, and up to four of those units to provide safe drinking. To provide basic medical care: To serve, with its medical platoon of 40 staff, up to 250 outpatients and 10 inpatients per day. Although the medical station will not perform surgery, it treats minor injuries and attempts to prevent the spread of disease. The aid station includes a laboratory, a pharmacy, limited obstetrics services and rehydration and a preventative medicine section. To produce safe drinking water: Water purification staff can produce up to 50,000 litres of potable water a day, as well as chlorinating local wells and monitoring water supplies. To repair basic infrastructure: Engineers can fix roads and bridges; repair electrical and water supply systems and build refugee camps. To make communications easier: DART sets up facilities to make communications easier between everyone involved in the relief effort, including the afflicted country, non-governmental organizations and UN aid agencies. In order to achieve these goals DART is made up of several elements. DART Company Headquarters, with about 10 CAF personal, is the main body of the DART, comprising Engineer Troop, Medical Platoon, Logistics Platoon and Defence & Security Platoon. DART Coy HQ provides command and control for its sub-units and sets their tasking priorities; it also provides a separate command team that can direct a split operation if required. The Engineer Troop, about 40 CAF members, includes both field engineers (in Water Supply Section, Heavy Equipment Section and Field Engineering Section) and construction engineers, to provide limited utilities and vertical construction services. With its Reverse Osmosis Water Purification Unit (ROWPU), Water Supply Section can purify up to 50,000 litres per day of safe drinking water, provided in bulk to the medical aid station and for distribution to local residents. Once the DART camp is established, the other sections of Engineer Troop undertake other basic construction and engineer tasks required to support humanitarian aid operations. The Medical Platoon, about 45 CAF members, operates a medical aid station, a small tented facility offering laboratory, pharmacy, rehydration, preventive medicine and limited obstetrics services. It should be noted that it does not provide surgical or trauma care services. The health care centre can serve 250 to 300 outpatients and 10 inpatients per day, depending on their needs. The Logistics Platoon, about 20 CAF members, provides the DART with almost all its support and sustainment services, such as transport, equipment and vehicle maintenance, and supply. The Defence and Security Platoon, about 45 CAF members, is the DART’s source of security and general labour services. It is important to remember that, as currently constituted, DART is not an emergency first-responder unit. Before it can be deployed the government of Canada needs to receive an official request for aid and assistance from the host government. With that formal request for assistance in place, the DART reconnaissance team is dispatched to assess the situation on the ground and determine exactly which emergency equipment and supplies are most urgently needed. Only then do transport aircraft begin delivering some of the equipment and personal required by DART. Rather then being first-responders they set up the conditions for an effective, life-sustaining effort – potable water, infrastructure, and medical services. The focus of DART is on doing what only such well-organized, larger military units can accomplish. It is also important to remember that as currently constituted DART is not a standing unit. Its members and much of its equipment are drawn from across the Canadian Armed Forces, pulled off other duties as necessary, to form a DART as and when needed. It is time for Canada to strengthen its ability to respond to disasters both nationally and internationally. There should be a full time DART, trained and equipped with its own resources, attached to 1st Canadian Division. The 1st Canadian Division (1st Cdn Div) is advertised as being a fully deployable unit trained and enabled at an advanced state of readiness to lead Canadian Armed Forces operations at home and abroad. The 1st Cdn Div is specifically tasked with responsibility for Non-combatant Evacuation Operations (NEO) and to deploy the Disaster Assistance Response Team (DART). A fully functioning DART would allow it to fulfill that mandate. To further increase Canadian security, as well as reinforcing our military abilities, other DARTs could be created based on our three current regular force brigades. Organized like our current DART, units from within both the regular and reserve communities, along with the appropriate equipment, would be earmarked to form ‘standby’ DARTs when 1st Division’s DART has been deployed. This would not be cheap, DART, in its current form, has an annual budget of CAD $500,000, although during specific incidents Parliament can choose to temporarily allocate millions of dollars to DART to fund their response effort. For example, Operation Torrent, the aid mission to Turkey in the wake of the 1999 earthquake which left 17,000 people dead, saw CAD $15 million used by DART in the response. Not cheap, but both necessary and useful. A department in competition with other departments of Government for scarce funds will find that Disaster Assistance Response Teams are a comparatively easy ‘sell’. In fact, Canada needs more DART. One that provides the necessity for increased military, and humanitarian, security for Canadians and one that meets our international obligations in a very useful way.